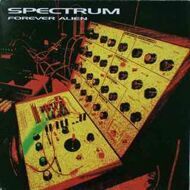 With theremin, vocoder, & an array of modular analog synthesizers Peter Kember (Spacemen 3), along with Alf Hardy & Pete Bassman, fused cosmische abstraction & the pulsation of minimalist composition to more traditional psych elements epitomized by early Pink Floyd, forming Spectrum. Landing between the unfettered experiments of E.A.R. & Spacemen 3's songcraft, Kember crafts unnerving atmosphere on the album & an enduring catalog high point on the consummate opener, "Feels Like I'm Slipping Away." This LP leaves no doubts about the reasons for Kemper's sought-after production today (he played a vital role for Animal Collective & sculpted PANDA BEAR's most recent albums) - nor the essential status of his post-Spacemen 3 output.